From Bondcliff Books . . . THE TINY NORTHEAST KINGDOM towns of Victory and Granby, Vermont, best known today for their proximity to the unique Victory Basin Wildlife Management Area, were once the scene of some of the most intense timber harvesting ever witnessed in that state. Although little evidence remains of them, lumberjacks and locomotives once ruled the day in the Moose River valley. In Logging Along the Moose River: The Story of the Victory Branch Railroad, retired Vermont forester and longtime logging railroad historian Bill Gove takes readers back to the late 19th and early 20th centuries, when timber was king in this remote corner of Vermont’s Essex County. 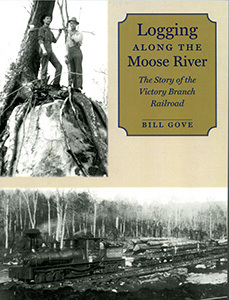 In lively text with nearly a hundred photographs, illustrations, and original maps, Gove tells the story of logging operations in the immediate vicinity of the Moose River, as well as the history of the Victory Branch Railroad, over which millions of feet of cut timber were once transported. Use your credit card or PayPal account to pay thru PayPal's secure cart service. Copyright © 2019 Branch Line Press. All Rights Reserved.